Angie put a lot of thought and originality into adapting the Tesselation Linocut project to her own purpose. Her boyfriend has a cat. 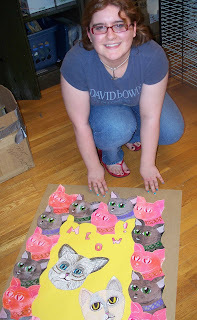 She created a marquee type frame for a mixed media cat picture. One could call Angie the "John Waters of Tesselation": over the top and riveting. She's also blogalicious. Check out more of her artwork and that of other CWRU art studio classes at our exhibition (April 28 reception 5-7PM, closes May 2)at the Art Studio Building.